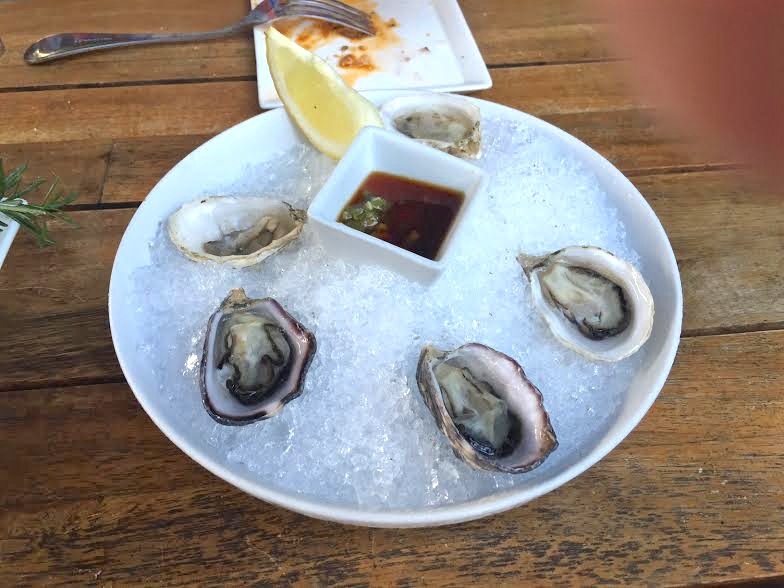 I was at a restaurant recently with an out-of-town friend who ordered scallops for dinner. 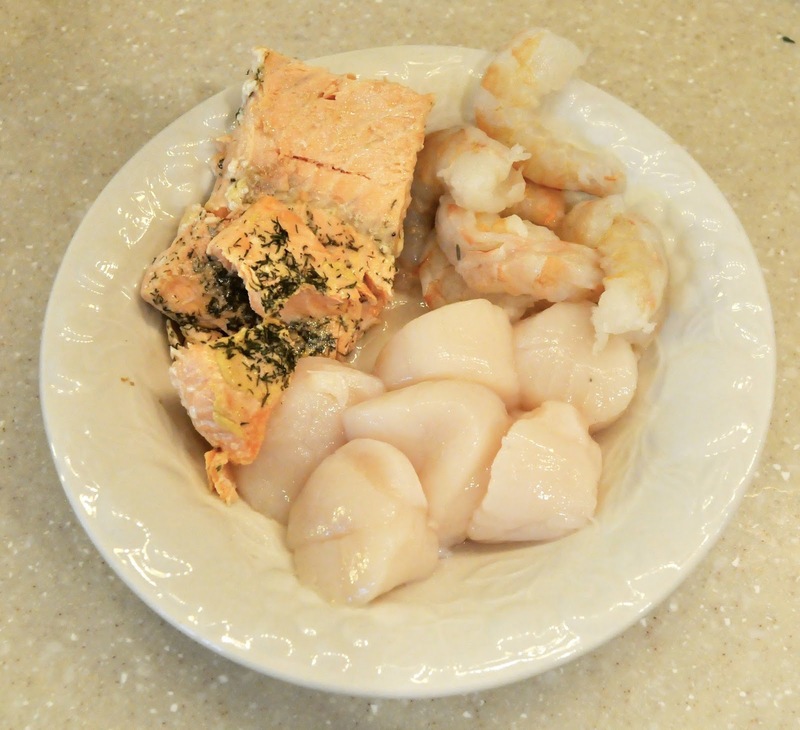 They arrived looking pale, small, and sitting in a pool of insipid liquid, which was almost unforgivable, given how easy it is to get a good sear and add flavor to scallops with some butter and seasonings. 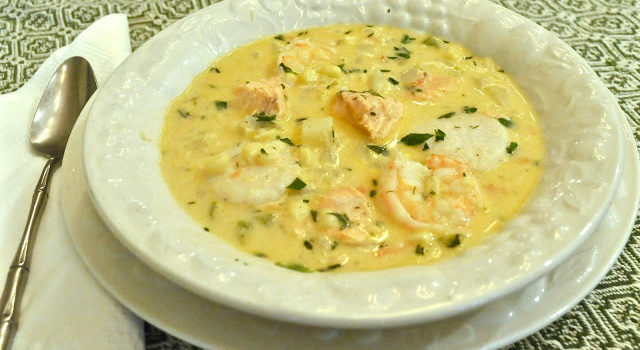 I’d like to invite her back and cook this recipe for her, especially while corn is at its peak and the scallops at our fish market are particularly fresh right now. We’ve had great corn this summer in New Jersey, but we purchased this delicious sweet corn at a farm stand in upstate New York last week, on our way home from the Glimmerglass Music Festival (where we also got a flat tire in the middle of nowhere, but that’s another story). It’s easy enough to slice the kernels from the cob with a sharp knife. 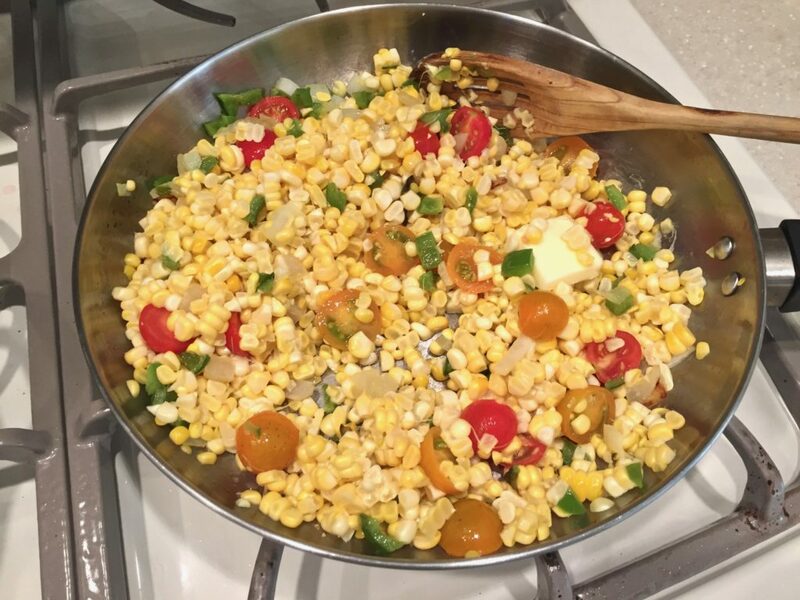 Sauté the peppers, corn and tomatoes in a skillet with some butter and olive oil, along with the seasonings. Meanwhile, use a large cast iron skillet to sear the scallops. Heat it until it’s screaming hot, then add the oil and butter. By the way, try to find the largest scallops you can. That way, you’ll be able to get a nice sear on the outside without overcooking the inside. Make sure you dry the scallops thoroughly with paper towels to avoid any moisture from oozing out. 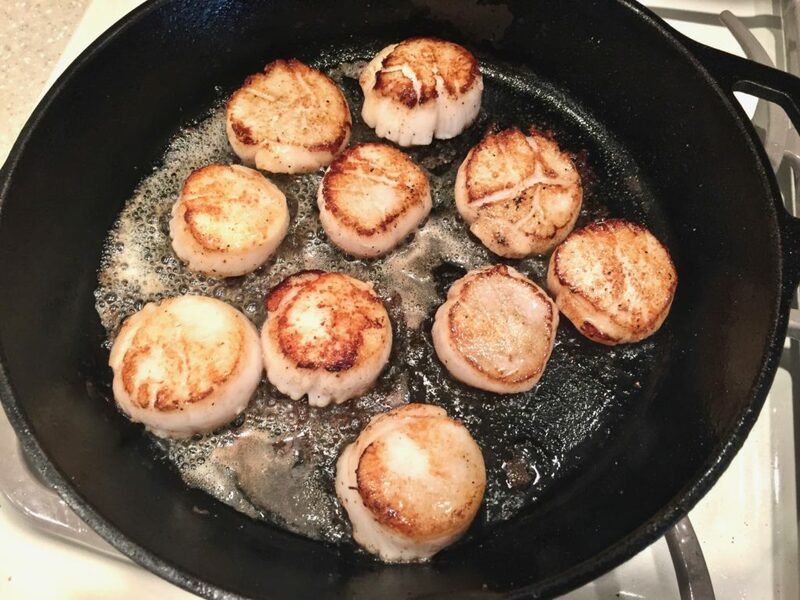 If your scallops have too much moisture, or if you crowd too many in a pan, you could end up “steaming” them instead of searing them. Sometimes, the scallops you buy are so filled with moisture, you wonder if the fish sellers injected them with water to make them weigh more. But these scallops, from our local fish market at the Jersey shore, were large, exceedingly fresh, and not at all weighted down with water. They sautéed beautifully in a minimal amount of fat (about 1 tablespoon of butter and one tablespoon of olive oil). But feel free to add a little more butter if you’re feeling indulgent. There are few things as delicious as browned butter over sautéed scallops. 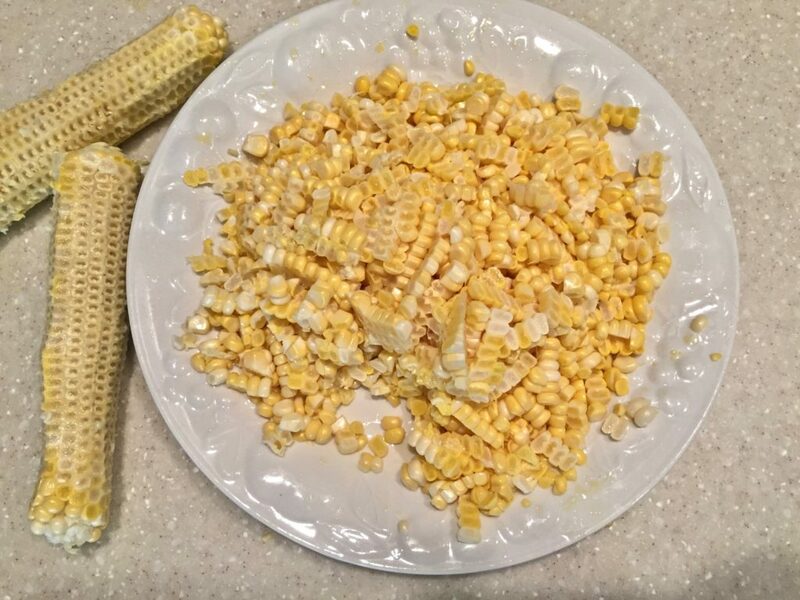 The whole dish takes less than 30 minutes to put together, from scraping the corn off the cob to presenting it at table. We ate this as a regular weeknight dinner, but it’s certainly company worthy too. The inside of the scallop is still moist, while the outside is well seared to a buttery goodness. 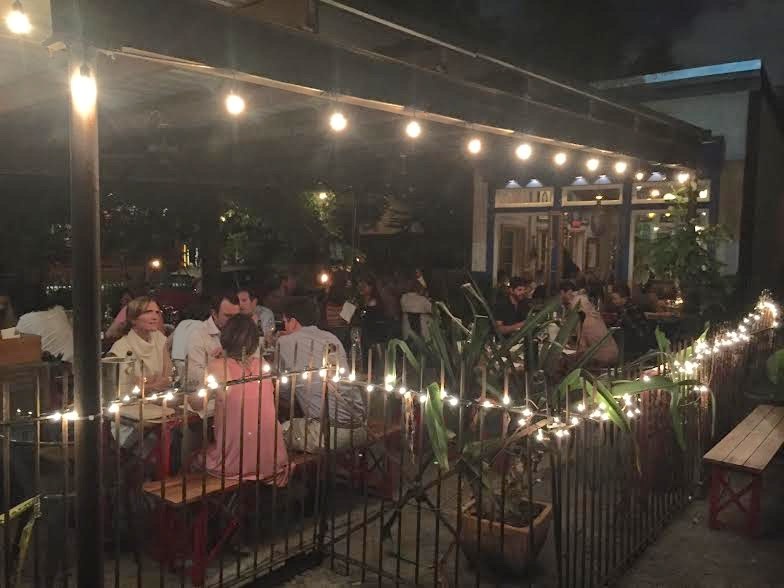 And now, for the winner of the giveaway in my last post about lobster fra diavolo and as my way of saying thank you to one of my readers as I celebrate 10 years of blogging, ta da … drum roll please!!! Sarah Zimmerman, you’re the winner of the $100 Lobstergram gift certificate, selected by a computer driven, random number generator. 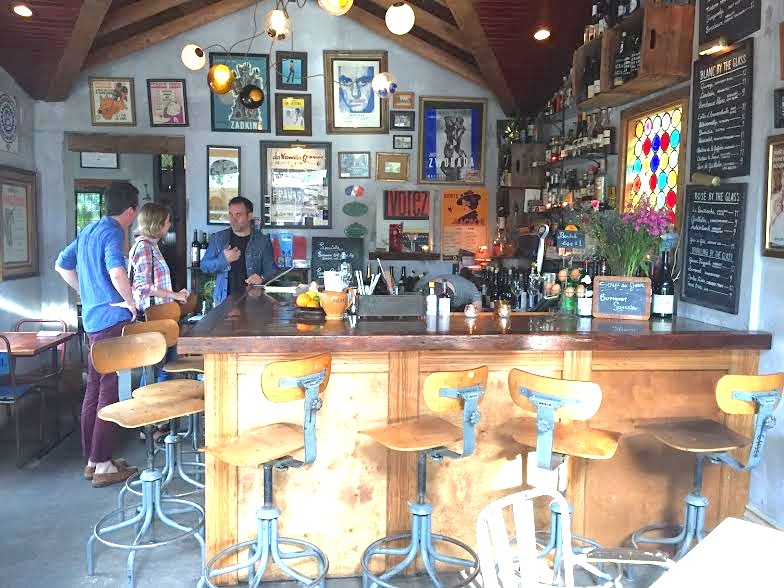 Look for the gift certificate in your email. 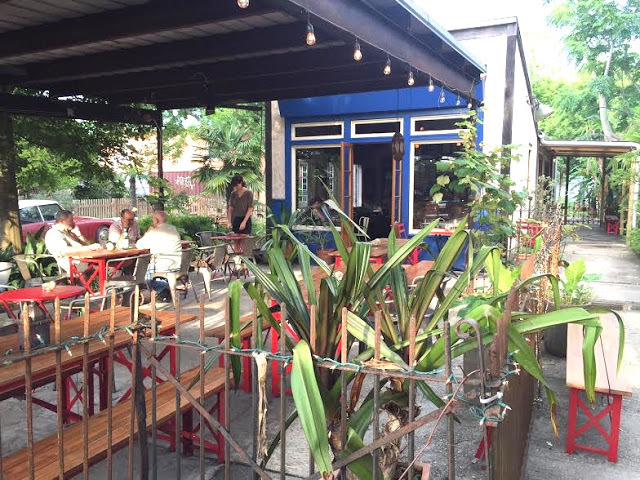 Thanks to all of you who left comments and have been reading Ciao Chow Linda through the years. To see what’s cooking in my kitchen, or what other adventures I’m up to, connect with me on my Instagram page here. about a dozen red and yellow cherry tomatoes, cut in half. Strip the corn off the cob using a knife. Add one tablespoon butter and one tablespoon oil to a skillet and add the minced green pepper. Saute for a couple of minutes, then add the tomatoes and corn kernels. 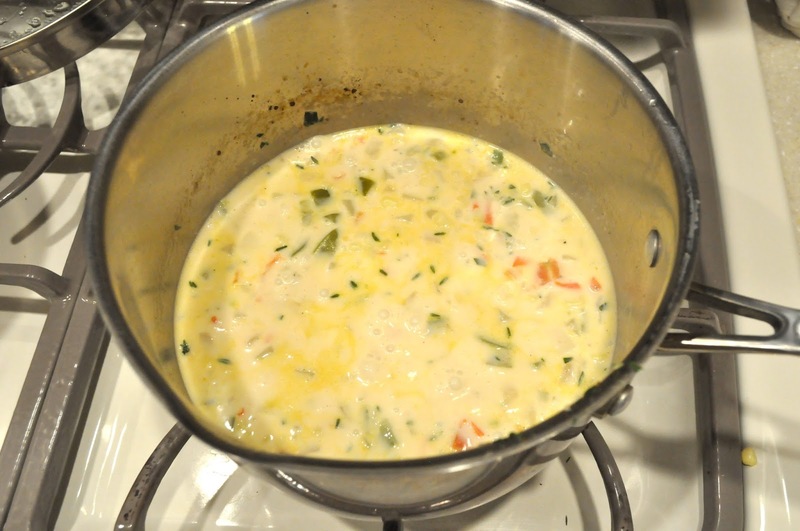 Season with salt, pepper and snippets of fresh chives and add another tablespoon of butter if desired. 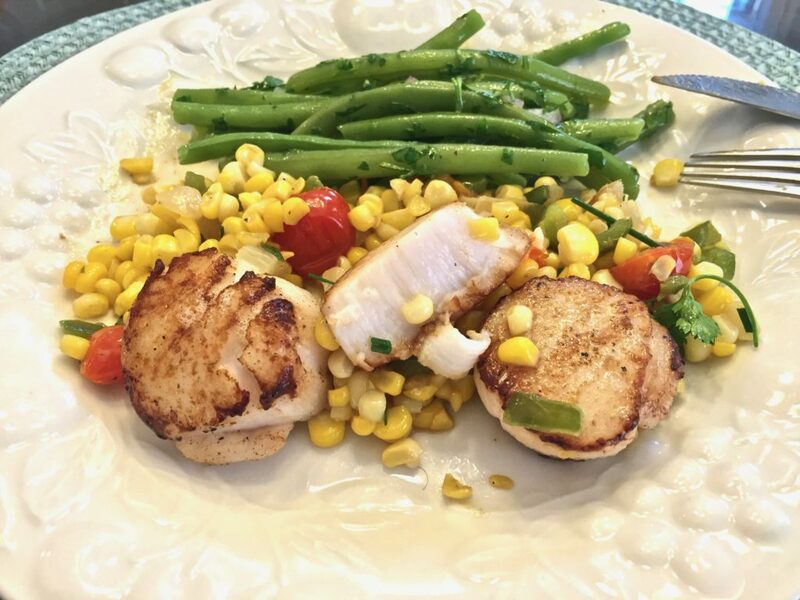 Cook the corn mixture over low to medium heat for two or three minutes while you sear the scallops. 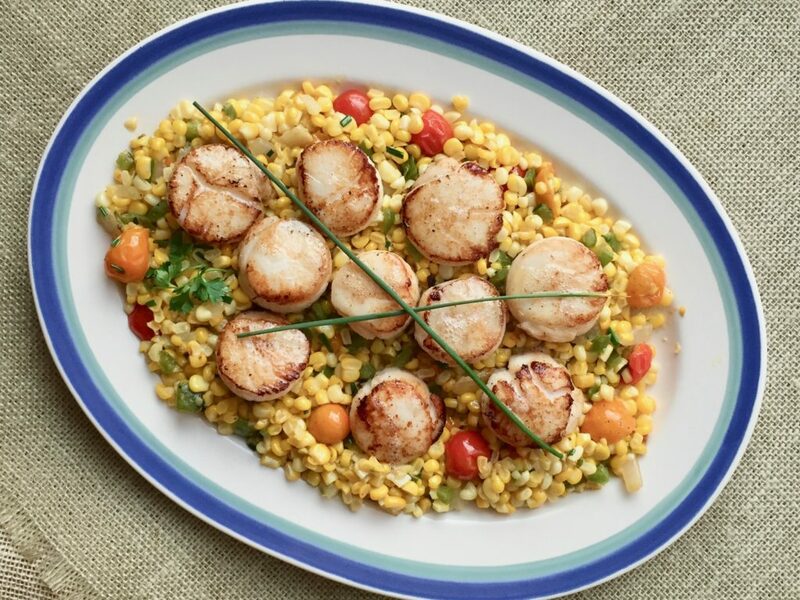 Make sure you buy the largest scallops you can find to ensure you get a good sear without overcooking the interior. Dry the scallops on all sides with a paper towel. Heat a large cast iron skillet until it's really, really hot. Add one tablespoon of oil and one tablespoon butter to the pan, then add the thoroughly dried scallops. Do not overcrowd or you risk "steaming" the scallops. Let them sear on one side for a couple of minutes only. Then flip and sear on the other side. When the scallops are almost finished cooking, transfer the corn mixture to a platter. 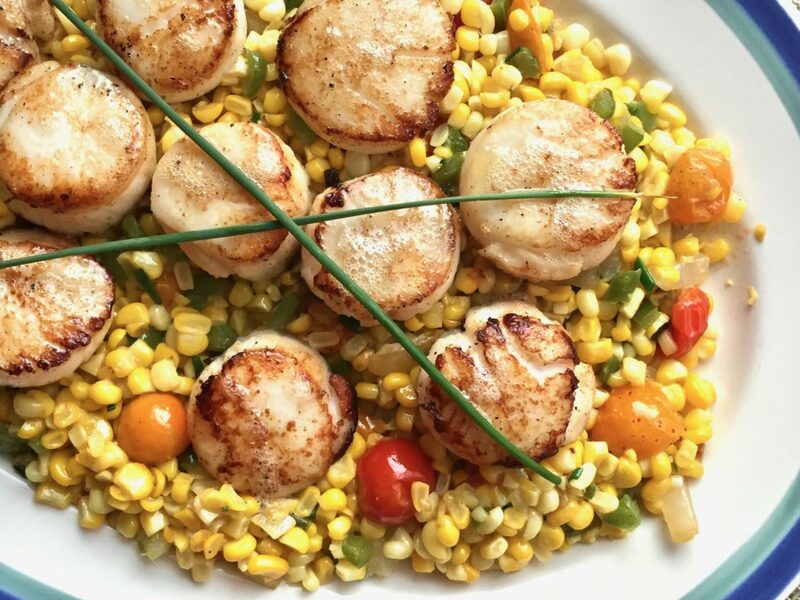 Remove scallops from skillet and place over the corn. Pour any butter/oil left in the pan over the scallops. Decorate with a couple of strands of fresh chives. It all started with about six ounces of leftover salmon and 1/2 cup of cream. 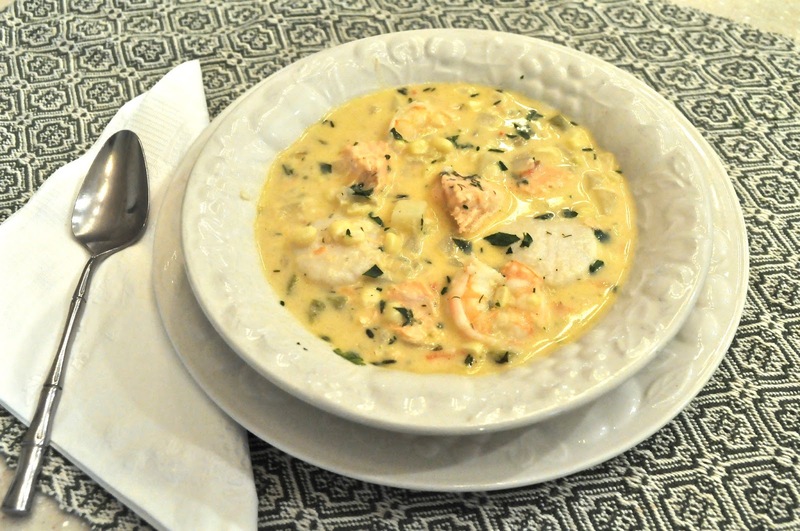 I’m not generally a fan of leftover fish, but as I was driving one day thinking about what to serve for dinner, it occurred to me I had the basis for a creamy chowder sitting in the fridge. So before I made it home, I picked up six scallops and six large shrimp at the fish store — and a couple of ears of corn at the local farm market. I had two large cherry tomatoes and a green pepper at home, so that got thrown into the pot too, along with some diced potatoes and herbs. need only a minute to heat. I thickened up the soup a bit by adding another potato that I boiled and mashed. If you want to eliminate the cream entirely, you can replace it with water and another boiled and mashed potato. But there is no substitute for that silky feel you get when heavy cream is used. Leftover salmon never tasted so good. The winner of the giveaway on my last blog post, a copy of Jamie Schler’s new cookbook, “Orange Appeal,” is Faith Bahadurian, chosen by a random number generator. Congratulations Faith.Want more Ciao Chow Linda? 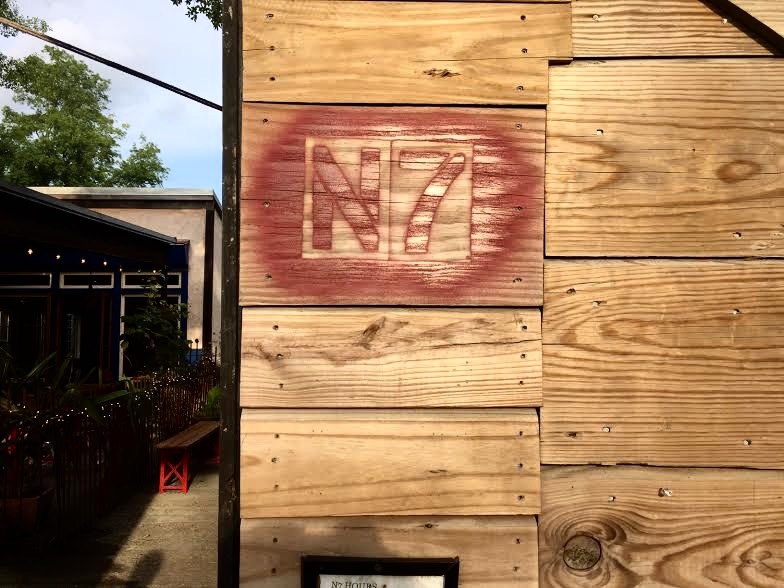 Check out my Instagram page here to see more of what I’m cooking up each day. the shrimp shells, retaining the water. together gently for a few minutes without a lid, then serve. 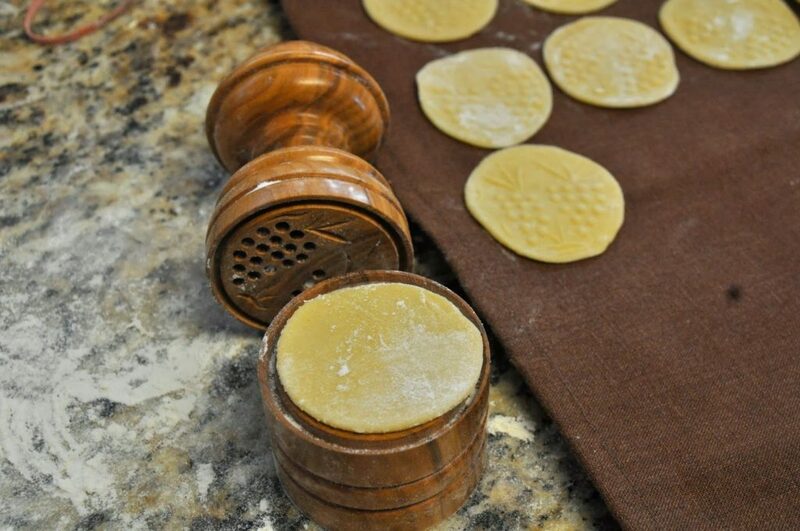 It’s pasta time with Dad again – this time with corzetti – beautiful round disks of dough made using a hand carved wooden implement created by Artisanal Pasta Tools in Sonoma California. 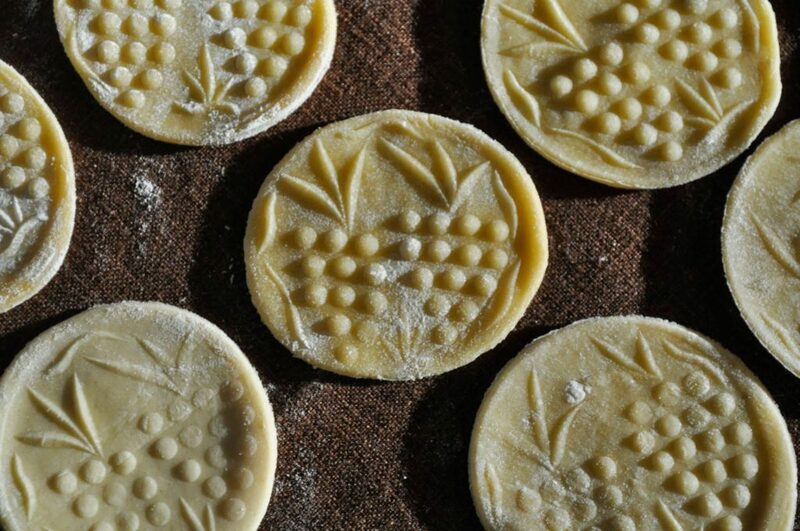 The one I used has a lovely design of clusters of grapes, but there are many patterns to choose from. Mine arrived in the mail one day, totally unexpected, as a gift from my friend and fellow blogger – “corzetti queen” Adri Barr Crocetti. 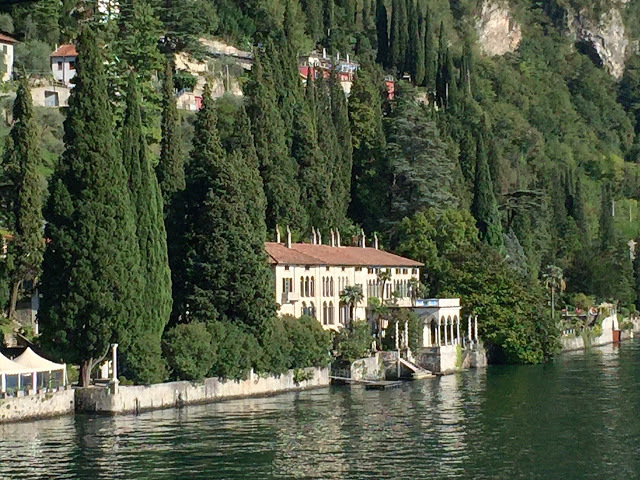 She writes a fabulous food blog, loaded with great recipes and thorough research on Italian food. Her beautiful photos are always so artfully composed and expertly shot. She has written exhaustively about corzetti and you can find her posts about them by clicking here. 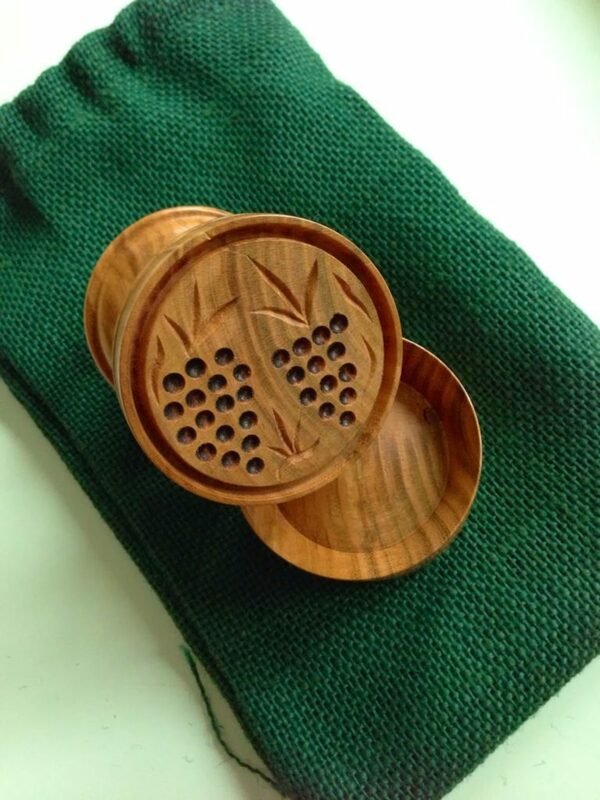 As soon as I showed my father this nifty tool, he was on board to make pasta with me. 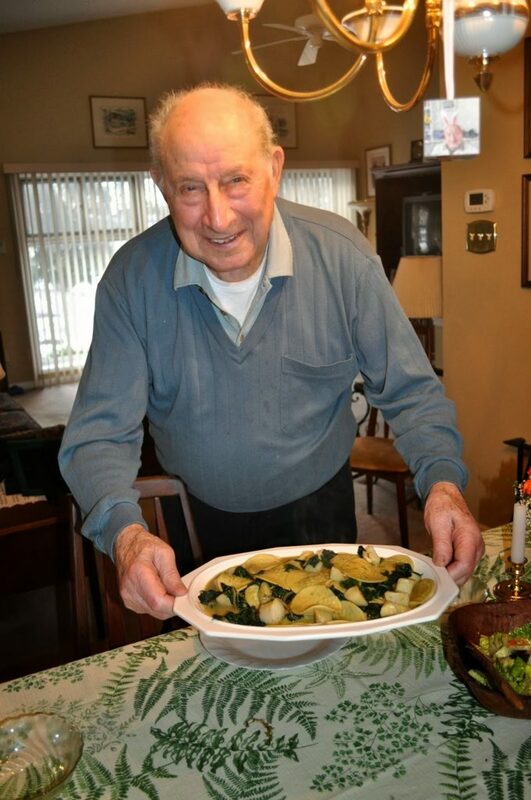 Regular readers of my blog know that my 92-year old dad loves to cook, especially pasta. We’ve made bigoli together (click here) , orecchiette (click here) and lots of other foods too. 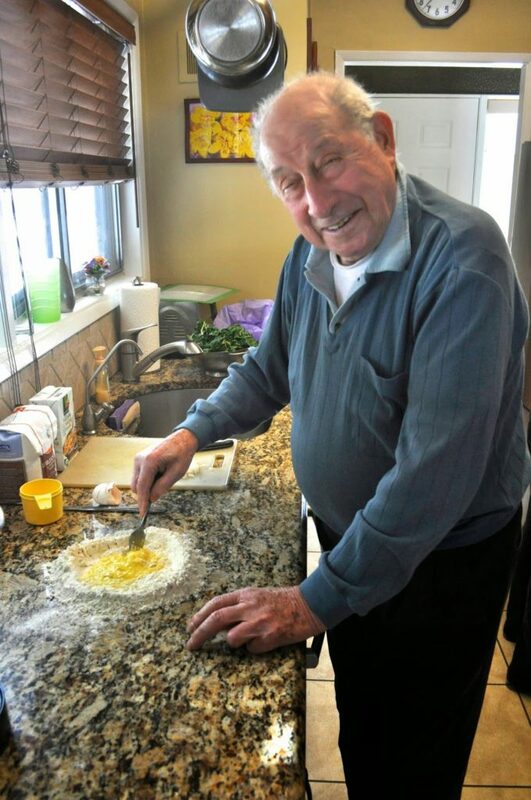 I arrived at his house and he was ready to go – mixing the dough on the counter and armed with a recipe to dress the pasta. We cut the disks with one side of the form. Then flipped the wooden implement to insert the disk and press down hard to make sure we got a good imprint. Lined up on a cookie sheet, they reminded me of Christmas tree ornaments. 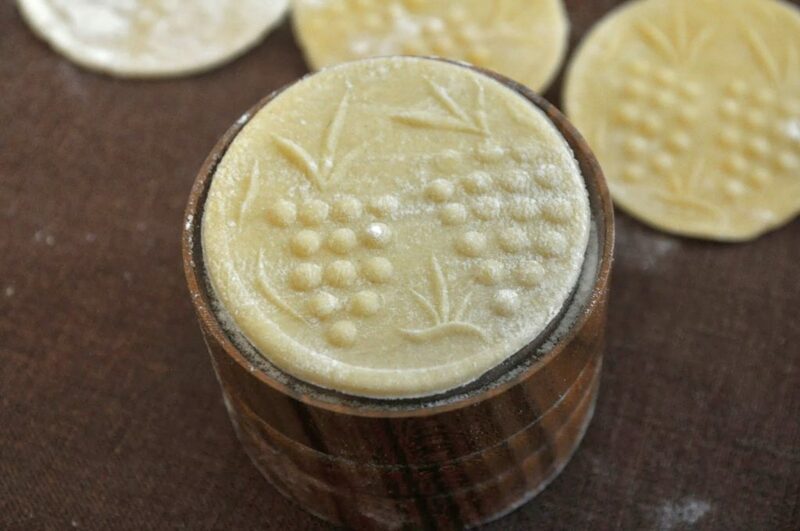 Hey, maybe that’s an idea for the future – poke a hole in the top, let them dry and give them a coat of some clear preservative. Here’s a closer view. They are like little works of art. 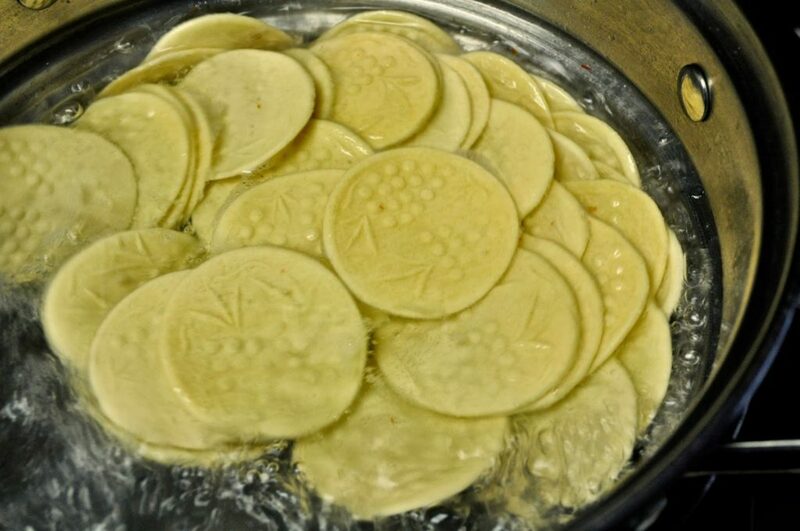 Corzetti originated in Genoa, a city on the Mediterranean in the region of Liguria. 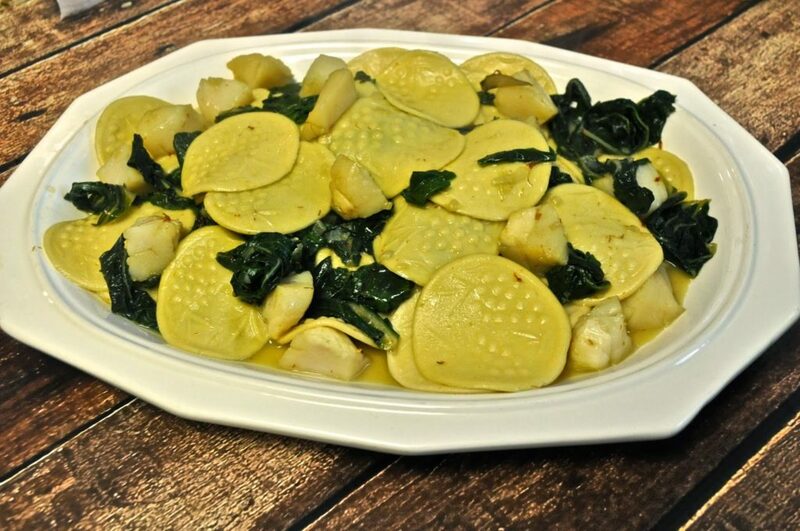 So it seemed fitting that we served them with some seafood – scallops and swiss chard, with some saffron. My dad found this recipe in an old issue of La Cucina Italiana. Unfortunately, for us Americans, the company stopped producing the U.S. edition. You can’t even access the online version, so sadly we’ve all lost a great resource of recipes. 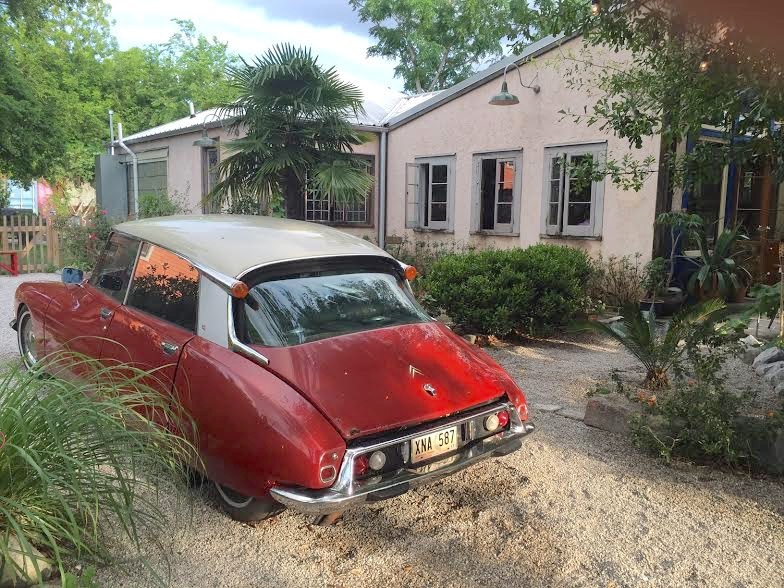 If you’ve got your old issues lying about the house, hang onto them. 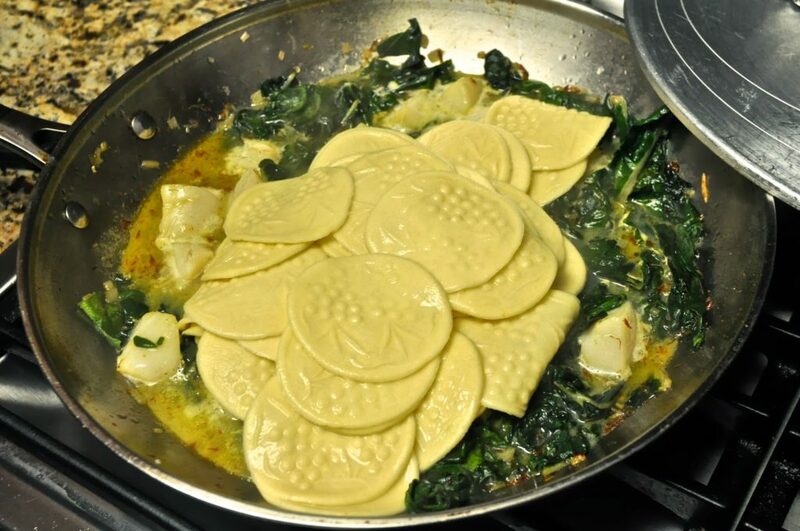 “Butta la pasta” is a commonly heard Italian expression, meaning literally “throw the pasta.” As the sauce cooked, (and it took only a few minutes), it was time for us to throw the corzetti into the water. We cooked them al dente, and added them to the sauce pan to swirl in the juices and meld the flavors. And then it was time to eat. It’s a great recipe any time of the year, but for you Catholics, it’s especially apropos for any one of these meatless Fridays during Lent. 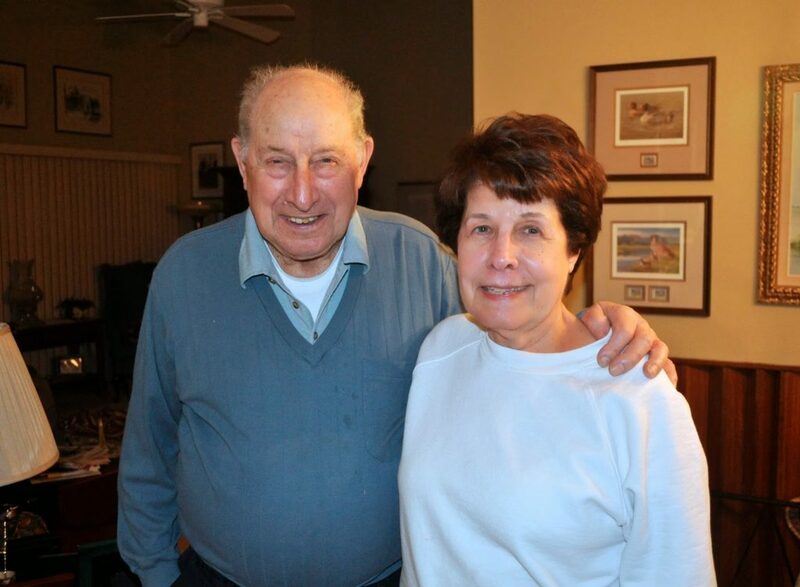 Since I’ve introduced you to my dad over the years, but never to his better half, I thought I’d throw in a photo of his wife Rose – a sweet, lovely woman who lets him (and me) have the run of her kitchen whenever he wants. We all had a fun day together making corzetti and plenty of memories too. If you can’t find dried corzetti in the store and want to make your own, here’s the recipe we used. But you could use any shape pasta here – from rigatoni to spaghetti. 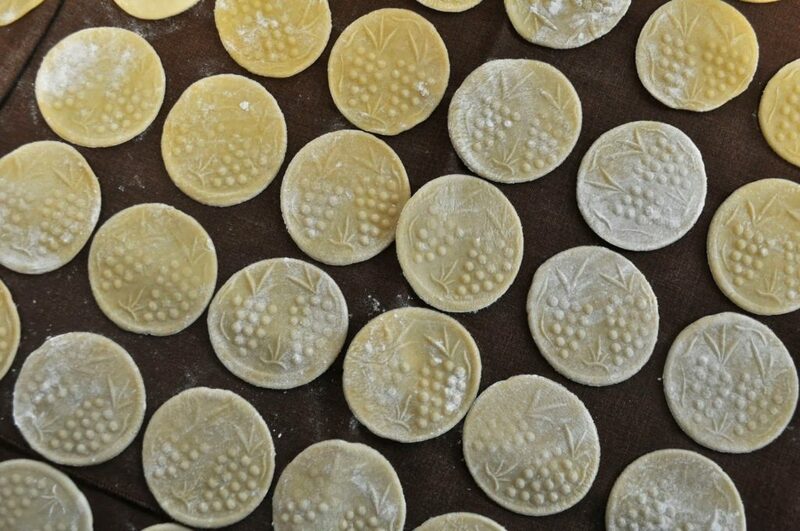 We used a simple pasta recipe of two cups flour and two extra large eggs, mixing the ingredients together, kneading the dough and letting it rest, before rolling out the dough and cutting the corzetti disks. If the dough is too dry, add a little water. Cut scallops into quarters; set aside. Bring a large pot of salted water to a boil. Meanwhile, in a large skillet, heat oil over medium high heat; add shallots, reduce heat to medium and cook, stirring occasionally, until shallots just begin to soften, about 5 minutes. Add chard in batches, then add broth, 1/4 t. salt and saffron; cook, stirring until greens are just wilted. 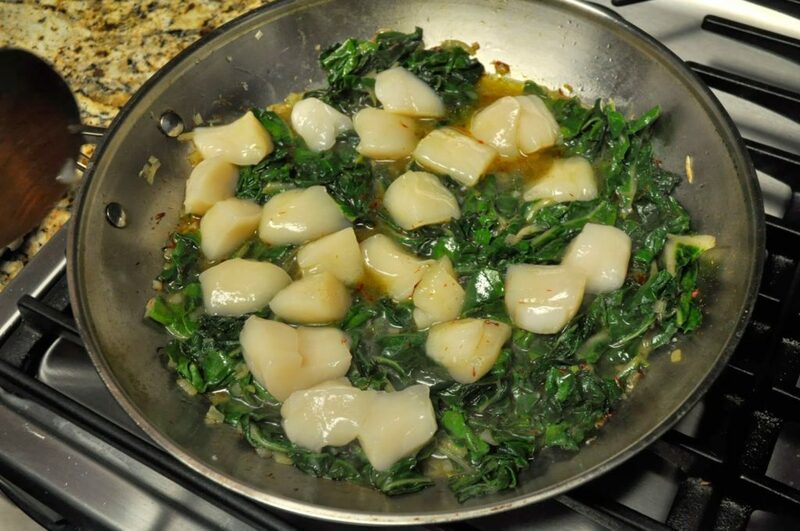 Add scallops to skillet, tucking pieces among greens; gently simmer, turning scallops occasionally, until scallops are just cooked through, 3 to 4 minutes. Add butter and gently stir until melted, then remove skillet from heat and cover to keep warm. Cook pasta in the boiling water until just tender – 6 to 7 minutes or until al dente. Drain. 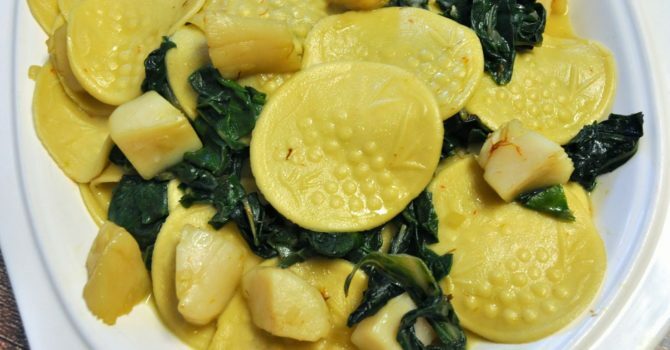 Combine the pasta with the scallops and chard in the pan. Sprinkle with pepper if desired. They’re still out there folks — blood oranges that is. I don’t know for how much longer though, so try this before the season is gone. It’s so quick and easy to make but tastes like something you’d pay a lot of money for in a fancy restaurant. 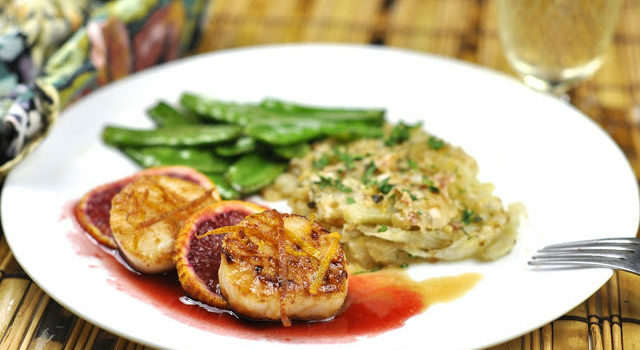 You can use regular oranges if you like, but of course you won’t get that striking red color that contrasts so beautifully against the scallops. This dish comes together in minutes, so make sure you have all the ingredients ready from the get-go. The sauce is really a gastrique – a fancy name for when you blend sugar or honey with vinegar and other flavorings and let it reduce. I liked it so much, I made it twice in the same week. 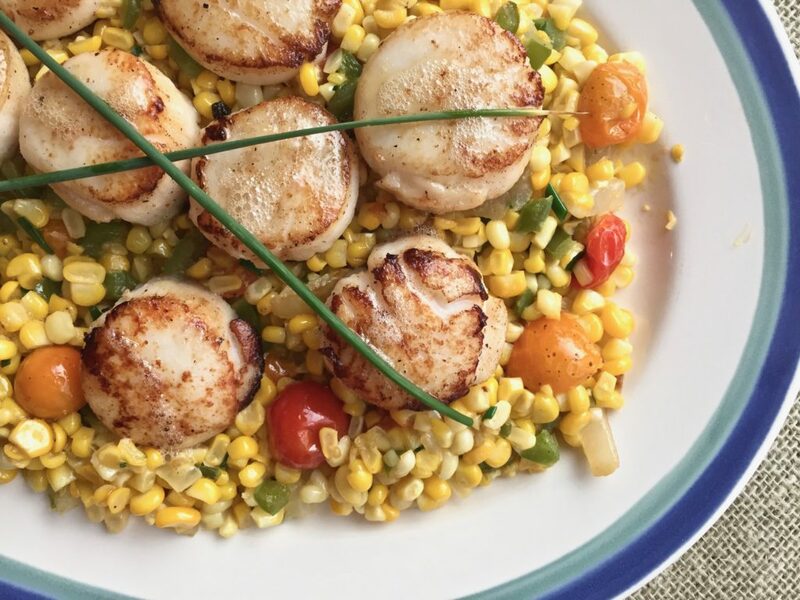 Try it and swoosh the scallops around in the sauce for a delicious flavor combo that’s good enough for company but easy enough for a weeknight meal. Make the sauce simultaneously while cooking the scallops, or make it a few minutes ahead of time. 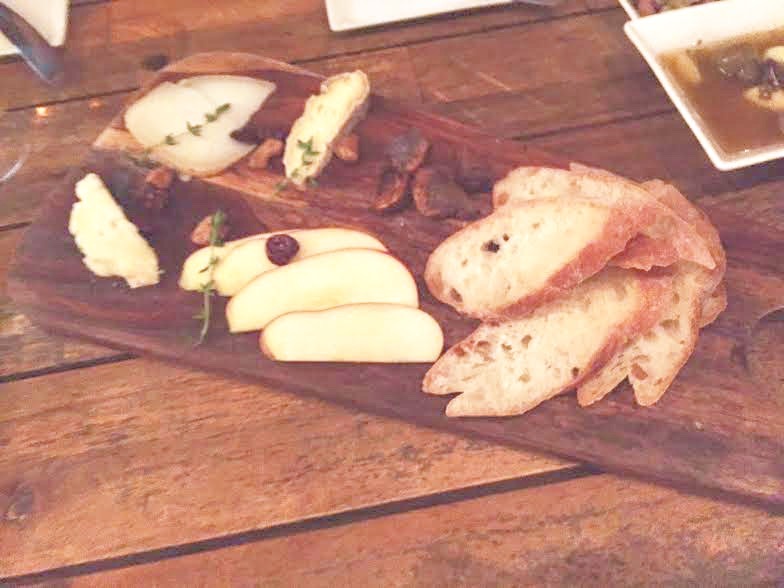 This sauce is what’s called a gastrique – when you mix honey or sugar with vinegar and other flavorings and let it reduce. Start by straining the juice from two blood oranges and putting it in a saucepan. Add the butter, honey and vinegar and reduce until syrupy. It should take no longer than five minutes if the flame is on high heat. Set it aside or keep it on a low flame while the scallops finish cooking. To achieve a nice color on the scallops, it’s important to get your skillet really hot before starting. Use a really sturdy stainless steel pan or cast iron skillet. Crank up the heat and let it get really hot. Then add a small amount of olive oil to coat. Place the scallops in the pan and let them sizzle. Don’t peek underneath. Just leave them alone for a couple of minutes and resist the temptation to lower the heat. The first side will brown in about two to three minutes if your heat was high enough. Flip them over and do the same thing on the other side. They should need no more than five minutes total to cook. Sprinkle them with salt and pepper. Remove to a warm plate and cover if you’re still working on the sauce. 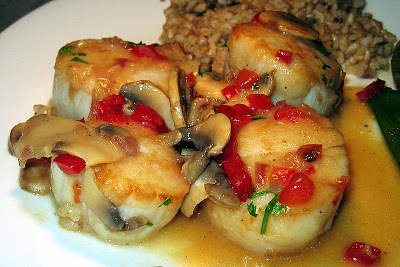 If the sauce is ready, place the scallops on a serving plate and pour the sauce around them. 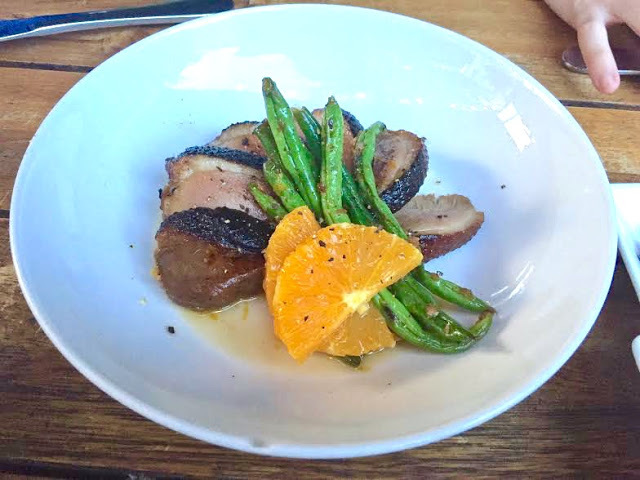 Garnish with grated orange rind. I’m a sucker for scallops. If they’re on a restaurant menu, I don’t give anything else a chance. It’s not just that I love the way they taste. It’s also that I could never figure out how to cook them properly at home. Chefs in restaurant kitchens use high BTU-stoves that most home kitchens lack. 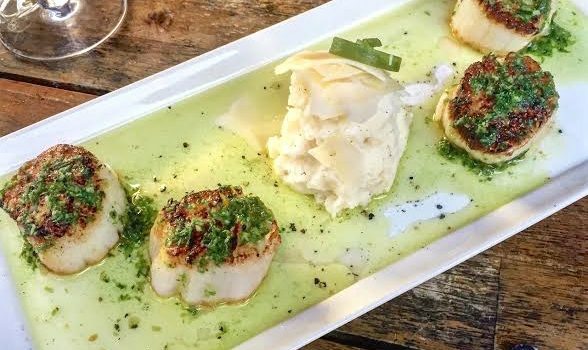 They’re able to quickly sear foods such as scallops without cooking the interior so long that it tastes like a rubbery hockey puck. Which is how mine used to taste — until I figured out how to make scallops every bit as golden on the outside and silky on the inside as a professional chef’s version. What’s the secret? Well, heat has something to do with it. But the first hint is to buy the largest sea scallops you can afford. Yes, they’re expensive, but you will only need three or four per person — or a quarter pound each. Remember, there’s no waste, and since they’re large, the outside has a chance to brown before the inside gets completely cooked through. 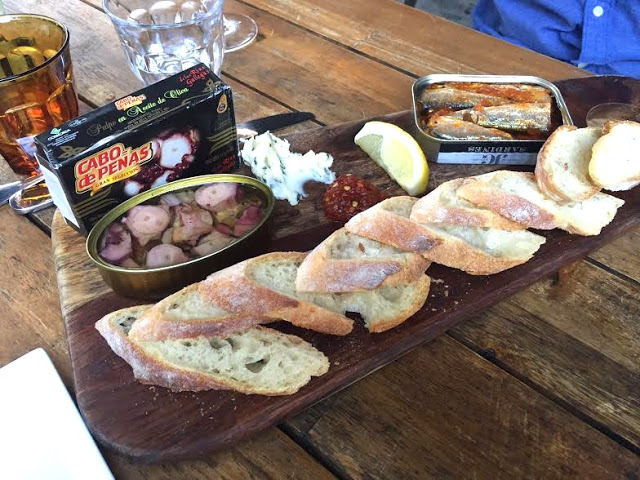 Be very picky at the fish market and exercise your veto power. Watch as the fish seller selects each scallop and reject any small ones he chooses. Then follow the technique in the recipe below very carefully, sit back and savor the results. You just might find yourself ordering roast duck next time you’re in a restaurant — since now you’ll be cooking scallops at home like a pro. This recipe is for two people but can easily be doubled or tripled. Read through the entire recipe and have ingredients prepared and ready to go next to the stove. You don’t want to be squeezing lemons or opening a bottle of wine while the scallops are simmering. The whole recipe takes less than 15 minutes from start to finish. Turn the fan on above your range. Place a cast-iron skillet over your most powerful burner and turn the flame up high under the skillet. Let it heat for a few minutes until it gets very hot to the touch. Then add the olive oil and let that heat for a couple of minutes until it is nearly smoking. 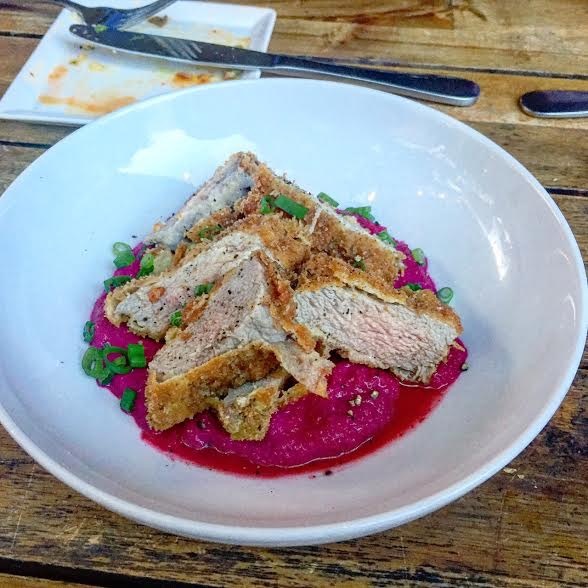 Don’t leave the kitchen for an instant. Dry the scallops with paper towels and lightly coat with flour. Add the scallops one at a time to the hot oil and cook for about 30-45 seconds on each side. DO NOT CROWD THE PAN with too many scallops or they will start to release liquid and reduce the temperature in the pan too dramatically. 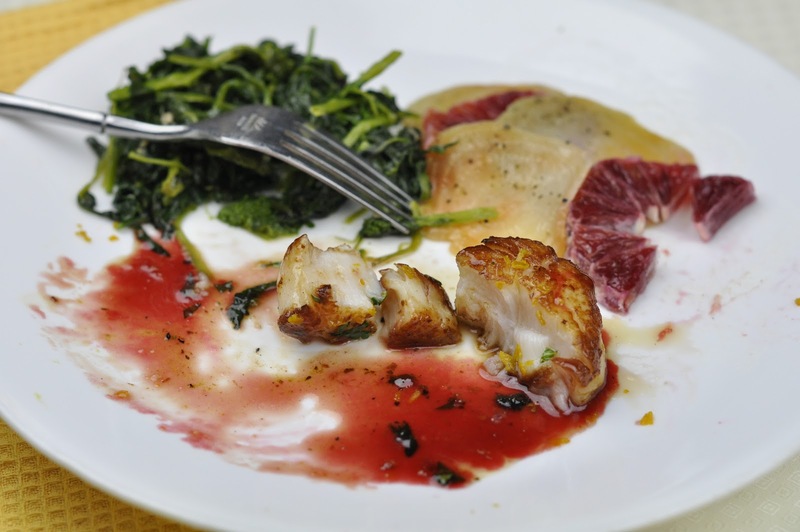 Remove the scallops from the pan and put aside on a plate. Take the pan off the heat and wipe the inside clean with a paper towel. Let the temperature cool down to medium, then add the 3 T. olive oil. Saute the shallots, mushrooms and red pepper in the olive oil for about five minutes or until cooked through. Put the scallops back into the simmering pan with any juices that may have accumulated on the plate, and pour white wine into the pan. Sprinkle with salt and pepper to taste over everything. Let the scallops cook for just a couple of minutes more, then add the butter for flavor and to help emulsify the sauce. Add the lemon juice and parsley, swirl the pan for 30 seconds, then serve.